Isaac Loeb Peretz (1852-1915), was born in Zamoscz, Poland, to a respected traditional family. He was privately tutored in Hebrew grammar, German and Russian, but his mother's extreme religious outlook prevented him from receiving a systematic secular education. In 1877 he passed an exam enabling him to practice law, a profession in which he excelled. From 1870 to 1878 Peretz wrote most of his works in Polish. The few poems he composed in Yiddish were not published and many have been lost. In 1875 he started publishing in Hebrew. 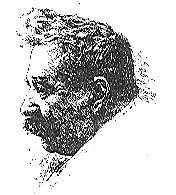 In 1886, after several years of literary silence, Peretz resumed writing poems and short stories, and in 1888 he began to publish in Yiddish. At the end of the 1880s, a false accusation resulted in his loosing his law license. Depressed, with no savings and no prospects, he left Zamoscz and moved to Warsaw. There he joined a group making a statistical survey, leading him to visit many small towns and villages, collecting information about the life of the Jewish population. Back in Warsaw, the unemployed Peretz plunged into various social and cultural activities, lecturing in Hebrew and publishing Yiddish short stories. In 1891 he secured a permanent position in the department in charge of burial sites for the Jewish community of Warsaw, where he continued to work until his death. In the 1870s Peretz considered both Yiddish and Hebrew a temporary means for educating the masses until they could learn the language of their native country. After the 1881 pogroms, however, his writing promoted nationalism, and since he had always been concerned with the fate of the underprivileged, his attitude toward Yiddish became more positive. He also wanted people to know Hebrew as well as the language of their birth country. While Peretz wrote in Yiddish, he also continued his literary efforts in Hebrew. In 1901 his collected works, in both Yiddish and Hebrew, appeared for the first time. His house in Warsaw became home to a group of Yiddish writers whom he always encouraged. During World War I he took care of refugees and their children. After a lifetime of defending and supporting the underpriveleged, his funeral turned into a mass demonstration.